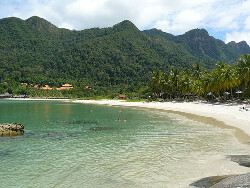 Malaysia has many miles of beaches along the South China Sea. The United States Sports Academy is seeking physical educators and sports instructors who are interested in teaching abroad in a new pilot program to retrain thousands of Malaysia’s physical education teachers. The Malaysia Ministry of Education (MOE) recently approved the program that begins in June and runs through the end of December. The courses will be taught in six different locations throughout the country, which is considered one of the most beautiful in Southeast Asia. While getting a pilot program up and running by June will be a monumental task, it is anticipated that once completed, the program will be expanded into a five-year effort. In preparation for this remedial program, the Academy’s faculty has developed the 10-course diploma program, which has been approved by the Malaysian Qualifications Authority (MQA), a national accrediting body. The Academy’s relationship with Malaysia spans nearly six decades, beginning when Academy President and CEO Dr. Thomas P. Rosandich coached in the country when it gained independence in the 1950s. Currently, the Academy is delivering its International Certificate in Sports Management (ICSM) and International Certificate in Sports Coaching (ICSC) programs through the National Sports Institute (ISN) in Malaysia. During its 40-year history, the Academy, also known as America’s Sports University, has provided programs in sport education to more than 65 countries worldwide. The Academy is the largest graduate school of sport education in the world and the only freestanding school of sport education in America with accredited programs at the bachelor’s, master’s and doctoral levels. Instructors selected to teach in the program can expect reasonable compensation in addition to round-trip airfare, housing, food and transportation while on assignment. Breaks in the teaching calendar will also afford the instructors the opportunity to experience the local culture and attractions. In addition to these intermediate term positions, the Academy is seeking instructors for two-week assignments in Malaysia in physical education, exercise science and sports healthcare. Anyone who is interested in these opportunities should have a graduate degree in a relevant field. Instructors who have any questions or who would like to teach in Malaysia should call Human Resources at the Academy as soon as possible at 251-626-3303. In addition, be prepared to email a letter of interest, résumé, and three professional references to: jobs@ussa.edu; mail it to: United States Sports Academy; Attention: Director of Administration; One Academy Drive; Daphne, AL 36526; or fax it to: 251-621-2527.